Received your night letter this morning. Thank you for all your good wishes. I hope you received my message O.K. We had our Christmas dinner at three o’clock this afternoon and it sure was a dandy. I enclose my place card & menu also a little note which I have attached. Please save them as they will be interesting mementos some day. In the first place, yesterday we were relieved from guard duty. I happened to be out of camp getting things for dinner when the announcement came. I have been acting as mess sergeant the last few days, hence my trips out of camp. I didn’t get back here till late in the afternoon & then when I heard about no guard I decided that we were going to have such a good time here that I would rather stay than go any place. Of course most of the gang had gone but there were fifteen good fellows here, so I stayed. Of course as mess sergeant I had a big part in the day’s festivities. We sure did have a good time. The first thing that took place was a reveille. The regular reveille was dispensed with and we slept till 8:30. At that time one of the cooks came over and woke us up with some sleigh bells. When we looked out all were disgusted because it was a rainy sloppy morning. Along about the time everybody was cussing the weather along came the cook with a big bucket of egg nog & gave all a good helping. That just took all the gloom out of us because it sure was good egg nog. Of course whiskey (for egg nog or anything else) is contraband in an Army camp nowadays but I managed to get enough for the egg nog through very unmilitary channels. There was only enough for the egg nog and not enough to do any damage and the whole affair was so unusual as to be a welcome break to the monotony of the life here. Besides as I said before it put everyone in good spirits for the day. Our dinner, as you can see from the menu, left nothing to be desired and it was very well cooked. The place cards were drawn by one of the fellows and were distinctly individual. After the dinner the presents were distributed. Each one was some personal take-off and they were a circus. Then we had a history of the organization from the time we gathered at Fort Sill with a lot more take-offs and then a lot of fake cables and telegrams from Pershing, Wilson, Baker, Daniels, Gen. Squires etc. It sure was a great laugh all the way through. The note I enclose was on my Christmas present which was a very small stick of candy. It seems that everyone here knows I like candy because I generally am offered first chance at the boxes which come into camp. On the whole we had a very successful Christmas & one that I’ll remember a long while. As long as I couldn’t be at home with you I would rather have been here than any place else. I have thought of you lots today and wished I was with you, but next year we will all be together again, so things will be O.K. I enclose a couple of Kodak pictures one of the fellows took of me here. Received your letters of the 20th & 21st yesterday. Thank you for the bill. I hope Sis is feeling a lot better now. Aren’t the Masons doing anything for Christmas for members in the Service? Not that I want anything but every other Mason here has had something if not more than a card and it makes me feel as though I came from an awful punk lodge. Beaver Dam has me pretty much disgusted anyway. If it wasn’t for you and the folks and a few people like you I’d never want to see the place again. They (the people) seem to be lacking in spirit and general patriotism, all except the ladies and a very few of the men. But the Red Cross certainly are doing their share, that is the only bright spot in the town. I wish they knew what I know about this war business it might wake them up. 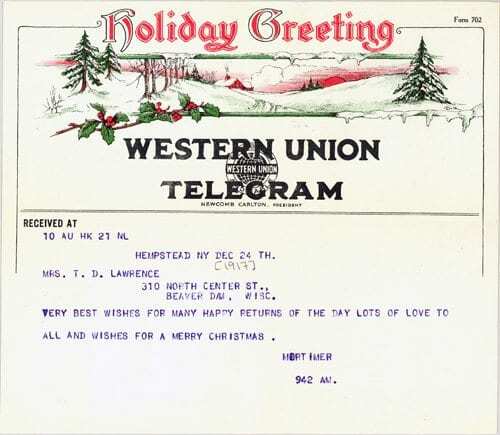 A decorative Christmas telegram that Mortimer sent to his parents. Received your letter today explaining about the Christmas gift. Please thank Father, Sis and Will for me. As soon as I go to New York I will buy a good watch but that won’t be for a few days. I wrote you that I had planned to go to Uncle Al’s on Christmas day. This afternoon that plan was all shot in the head (body and every place as a matter of fact). An order came down from headquarters detailing us for guard duty on Christmas day. That is more than pleasant and there are some of the sorest guys in the world in our bunch tonight. While I am disgusted I am not one of the soreheads hollering about it. I enlisted to obey orders and that sure is an order. There has been a little hard feeling around camp because our bunch was the only gang not doing guard duty. All other cadets have been on same as the Aero Squadron but we have managed to stay off. So that probably is the reason we were given a Christmas detail when they finally decided to put us on. 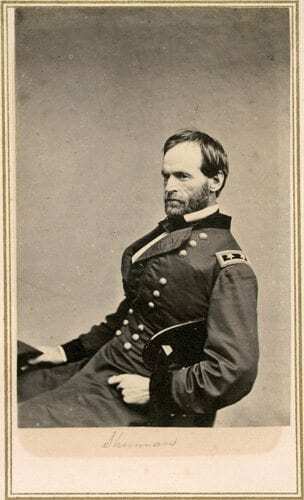 I am awfully sorry not to go to Uncle Al’s because I had such a splendid time when I was there before, but this is war and Sherman was surely right. It seems awfully funny that I haven’t received a single one of the packages you sent last week. Were they insured? I can do nothing from this end because the Garden City P.O. is only a one-horse affair and is simply swamped with mail since the soldiers came. I hope the packages come soon. I came over here to get a pair of shoes which are being soled and thought I’d write this while I waited. While I have been writing a young civilian came over and invited me to go to his home for dinner. Alas I had to decline because my pass is only good till 5 P.M. I don’t know why he picked on me unless he liked my looks. As a matter of fact I am very attractive compared with some of the men you see for I do keep clean and have a good fitting, well pressed uniform. But it pays to be ambitious and look snappy. That is what got my appointment to Fort Sill, I know, for that is what took the Colonel’s eye after Capt. Pearson recommended me. It costs money to keep your clothes in trim but it is worth it. Must stop now and go back. Lots of love to all. Thank you all for the money. Best wishes for a very Merry Christmas. As I said in my night letter yesterday, we have been informed that we will be commissioned as soon as we get to France. One of our men went to Washington last week and through a friend (Major Smith) managed to see several of the higher officers in the Signal Corps and the War Dept. It seems they had lost all trace of us through some mix up down there. One man thought we were overseas and another that we were still at Fort Sill. After much trouble they succeeded in locating our papers. 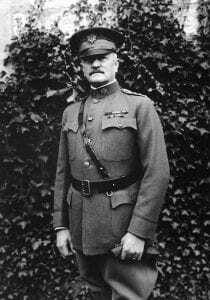 Then the high mogul, McCain the Adjutant-General of the Army, cabled Pershing that we were to be commissioned on arrival. He also established our status as “cadets” which may not mean $100.00 per month but does mean good accommodations on the trip abroad. Under the circumstances I didn’t want to go across with practically no money because if we are commissioned there are certain things like collar ornaments, hat cords, etc. which we will have to have at once. The $50.00 will supply those things and the rest of my equipment I can get out of my pay. With such uncertainty about what will really happen I hated to ask you for the $50.00, hated to ask you anyway, but I hated worse to land overseas without any money. Of course I am not exactly broke because we were paid Saturday but out of my $20.00 I have had to buy a supply of tobacco, soap and other little things that are hard to get in France. We may be here till after Christmas and in that case I will surely try to get home but I am much afraid I will have no chance. However I will do my best. I received the notification that the money was at the telegraph office but I have to go to Hempstead, a small town near here to get it. I will do so tomorrow morning. Thank you very much for sending me the money. I no doubt will be able to repay you very soon if we get our commissions. We don’t seem to be learning anything new about our status here and nothing has happened so I am at a loss what to write. Since I have quit cooking I have been out drilling with the rest of the gang. We don’t do much, but just enough to keep us from going stale. Of course we have no rifles or any arms so we have nothing but foot drills and setting-up exercises. The weather here is pretty good as a rule, cold & snappy of course, but fine for drilling. Everyone is getting rather impatient because we get no news or information of any kind regarding ourselves, but I don’t know what we can do. However we aren’t very uncomfortable here, we have a good bunch of fellows and the eats are good, so we really have nothing to holler about. I hope you liked the pictures. If you want more let me know.